The Haber Process, also called the Haber-Bosch Process, is a complex chemical procedure that takes nitrogen from the air and under high pressures and temperatures combines it with hydrogen to produce ammonia. This ammonia is the base of the synthetic nitrogen fertilizers increasingly used around the world today. Nitrogen, a key component of all proteins, DNA, and RNA, is vital to life here. Plants can only use fixed nitrogen and the lack of fixed nitrogen is often the limiting factor in an ecosystem or for crops. Our ability to fix nitrogen ourselves seemed to be a perfect solution. However, the enormous blessings of the Haber Process are balanced by some pretty serious curses. On the blessing side synthetic nitrogen fertilizer produced by the Haber Process is credited with feeding a third to half the present world population. In fact about half the nitrogen in each of our bodies is there thanks to the Haber Process. Serious imbalances to the nitrogen cycle. High fossil fuel energy inputs. Negative effects on soil organisms and soil organic matter. Excess runoff cause ocean dead zones. Major component of weapons including all those roadside bombs. Through the 1800's, heavily populated countries in Europe such as Germany and Britain used guano from islands off the coast of Peru and salt petre from Chile as a source of natural nitrogen fertilizer. This trade was much like our current oil trade in importance both for food security and politically. By the end of the 19th century these sources of fixed nitrogen were running out. Scientists were challenged to come up with a process of making fixed nitrogen from the nitrogen in the air. The winner of the race was Fritz Haber. His tabletop contraption used high pressure, heat and a catalyst to slowly, drop by drop, synthesize a cup of ammonia over the course of two hours. The German chemical company BASF bought the process and Carl Bosch was charged with upscaling it to factory size, a feat he managed by 1913. The process, often called the Haber Bosch Process requires high pressures, 200 - 300 atmospheres, and high temperatures, 400 to 550 degrees C.
For a brief time the first factory turned out fertilizer. With onset of WW1 Germany needed munitions for its war effort. The factory was seconded to munitions and is credited or blamed with greatly prolonging WW1 and making WW2 possible. These synthetic nitrogen fertilizers are explosive. 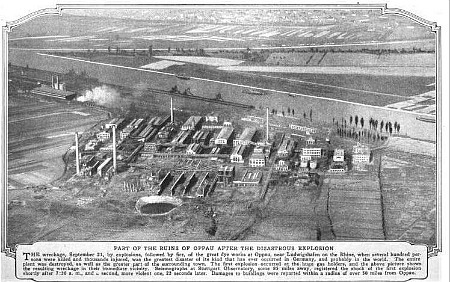 This photo shows the aftermath of the 1921 Oppau explosion that took place at the BASF ammonium nitrate factory there.Between 500 and 600 were killed and 2000 injured. It wasn't until the 1950's, after the first and second world wars, that the Haber process really started to affect farming. 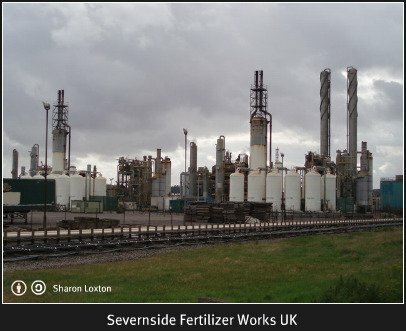 Ammonia stocks, diverted in wartime to make bombs and bullets, started being used to produce the synthetic nitrogen fertilizers used everywhere today. 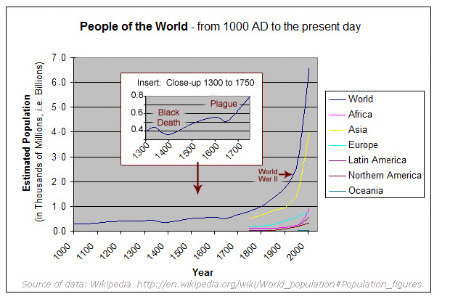 Increased food production has allowed the human population to swell to its current almost 7 billion size. Estimates are that a third of the earth's human population is fed thanks to the Haber process. Many people believe that to stop or limit the use of synthetic fertilizers would lead to mass starvation. Our impact on the nitrogen cycle is actually bigger than our effect on the carbon cycle. We convert more N2 gas into fixed reactive forms than all the Earth's processes combined. Synthetic nitrogen fertilizer production, vehicle exhaust emissions and even growing nitrogen fixing crops all fix nitrogen. We add an estimated 140 million tons of fixed nitrogen of which roughly 80-100 million tons is from the Haber process chemical plants. If you study scientific material on the nitrogen cycle you can't help but notice that molecules of nitrogen that get fixed can also get unfixed. Nitrogen fixing bacteria are balanced with denitrifying counterparts in roughly equal proportions. Over time there might be a slow increase in fixed nitrogen but in the natural world the shift is very slow. The Haber process contributions of reactive nitrogen are not offset by denitrification. 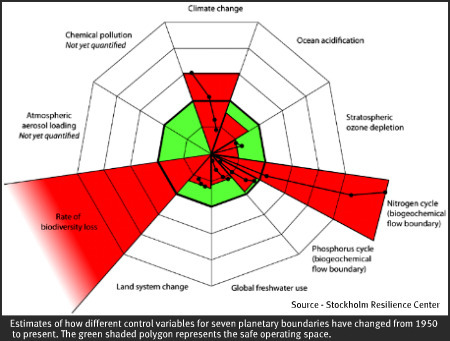 A group of scientists led by Johan Rockstrom explored the questions of planetary boundaries in an article recently published by Nature. The usual climate change issue was of course reported. What might surprise you though is that while we have only just slipped past the edge of the CO2 boundary, the nitrogen cycle disruption was deemed to be about three times over the safe limit. This graphic illustrates the extent to which we may be overstepping the nitrogen boundary. These scientists suggest we reduce our fixed nitrogen additions to about 35 million tons or roughly a third of what we are currently slinging onto fields and belching out of cars and factories. Given that the Haber process requires temperatures of 400 - 550C and pressures of 200 - 300 atmospheres it's not surprising that it uses a lot of energy. Manufacture of nitrogen fertilizers uses about 5% of the world's natural gas production, equivalent to 1-2% of the world's annual energy consumption. While natural gas is among the more plentiful fossil fuels, this level of use is not sustainable in the long term. As well, as oil reserves worldwide dwindle, prices will rise putting fertilizers some farmers have come to depend on out of reach for the poor. A balanced diet for soil organisms in simple terms is about 20 parts carbon for 1 part nitrogen. 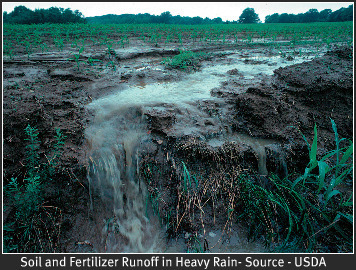 Adding nitrogen fertilizer to soil usually creates a surplus of nitrogen. To balance their diet the soil microbes go after carbon reserves in the soil - first the easily digested stuff and then the humus. The organic matter in the soil is lost. The soil food web, that intricate web of civilization living in the soil, is starved and begins to die. The functions they performed, whether they be fixing nitrogen, making phosphorus stores available or defending crops against various pests and diseases, are also lost. As the natural system breaks down the soil organisms who survive tend to be the bad guys. Their usual enemies are gone. Erosion of topsoil increases; pests and diseases increase. Not a good scenario. Farmers, to maintain yields, turn to more chemical solutions. More fertilizers, more herbicides and pesticides... and more trouble for the community making it's home in the dirt. As well, recent research at the Center for Ecology and Evolutionary Biology at the University of Oregon by Dr. Jennifer Fox, found that communication links between plants and nitrogen fixing bacteria are damaged by use of excessive synthetic nitrogen fertilizer. This leads to less nitrogen fixed naturally and increased reliance on synthetics. Plants can absorb the nutrients available through chemical fertilizers. However, often the dose is too much too fast, and much of the fertilizer is wasted. As little as 10% may be actually absorbed by the crop and rarely more than 50% of the fertilizer applied makes it into the crop grown. The nitrogen fertilizer tends to be especially mobile in the soil. It passes right by the plants and off into ground water polluting wells or is eroded into surface streams. The huge ocean dead zones are a result of nitrogen and other fertilizers and farm chemicals ending up in watersheds bound for the oceans. There is still a good chunk of Haber process nitrogen that winds up in war zones. In fact many of those roadside bombs terrorizing people in various parts of the world are made in part from Nitrogen fertilizer synthesized with this process. The synthetic nitrogen fertilizers brought to us complements of the Haber process seemed at first a boon to humanity. Synthetic chemical fertilizers have only been commonly available in the last 50 years. Using synthetic fertilizers has become so routine farmers who use them are considered conventional while those using the techniques thousands of years old are called organic. Given that so little of the Haber process fertilizer actually makes it into crops (and so much into the ocean) it seems to me that we may be able to feed the world better with a lot less chemical additions if we pay a lot more attention to biology. On a personal scale making and using compost is a step that restores soil and their communities. Can that be a bad thing? Want more information? These books will let you delve more deeply into this topic. The Alchemy of Air is Fritz Haber's biography. I'd balance it with one or more of the other books to explore the hope of soil biology. Canadians can access the Amazon.ca store from the second set of links.